In her article "Who Has the Last Laugh? Nanook of the North and Some New Thoughts on the Old Classic," Anna Grimshaw recounts the earlier criticism of the film, which focused on such issues as imperialism/colonialism, the "othering" of the Inuk man and his people, "untruths" in the plot and characterizations, as well as the staging of scenes belying the documentary ethos. 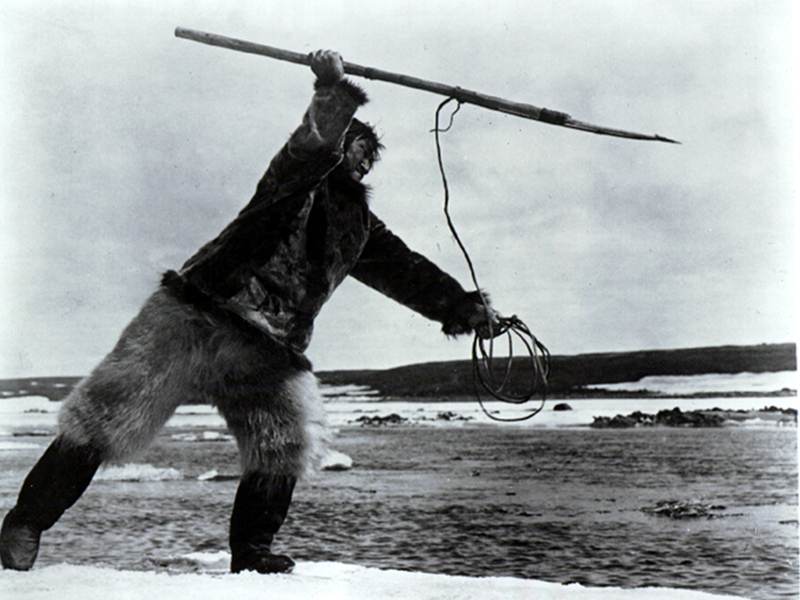 Grimshaw goes on to celebrate the 1922 classic - directed and edited by Robert J. Flaherty, and shot in the Canadian arctic - arguing that the film is a "cinema of attractions" (following Tom Gunning) and that Nanook (actually named Allakariallak) displays a certain "agency" in his direct address to the camera, which includes a sparkle in his eye, obvious wit, and an engaging sense of humor. Indeed, we know from the opening title cards that Flaherty showed dailies to the subjects; thus they were involved in the process; they knew and understood what the result could or should be in order to share their lives with those living beyond their arctic world. For Grimshaw, Nanook and the other characters' engagement with the camera as well as the "haptic" scenes draw viewers into a "sensory" relationship with the performance and likewise the performers. She points out that Nanook is not only in on the joke but he also "can barely contain" his "hilarity." To that end, she agrees with Shari Huhndorf who both suggest "perhaps the last word, indeed the last laugh, belongs to Nanook" (I am quoting Grimshaw here). Indeed, Grimshaw goes on to argue that Nanook's agency is "not only discernible in the scene at the trading post" (where he pretends not to understand a gramophone), but "it is manifest in every scene in the film." Taking Grimshaw's analysis as my starting point, I'd like to put a little more analytical pressure on her view and examine the hunting scenes, which showcase Nanook as the premier sportsman of the arctic. These scenes underscore the argument that Nanook displays agency - so much so that it actually surpasses or transcends other faults in the film. As Robert Ebert asserted, "If you stage a walrus hunt, it still involves hunting a walrus, and the walrus hasn't seen the script. What shines through is the humanity and optimism of the Inuit." I would also add that what shines through is the skill and intelligence of the star. The first hunting sequence actually involves fishing - a kind of a hunt I think we can agree. Nanook expertly crosses ice floes, finding his footing with the use of a stick that he pokes into the ground to test for firmness. Once he reaches his fishing hole, he dangles pieces of ivory as a lure and spears the fish that come near. His patience, ambidexterity, and speed compel the audience to admiration as we watch a man traverse snow and ice - and remain through chilly wind - to provide sustenance for his people. As if this scene were not enough to impress us, Nanook arrives and leaves via kayak, rowing with a double sided paddle, showcasing yet one more of his considerable talents. In another hunting sequence, Nanook and his friends travel to a remote outpost where walruses have been spotted. These men must work together as a team to harpoon the walrus and reel him in through the pounding surf. Afterwards, they and their huskies drag the walrus over snow-covered hills and valleys to prepare it for the community consumption. Nanook provides a leadership role throughout the hunt, but he likewise works well with others to accomplish the goal that allows them all to survive together. While there are those who have decried the film as "savage ethnography" and belittling of the Canadian natives, I, for one, view the documentary with nothing but admiration, even adoration, for the sportsman Nanook, AKA Allakariallak. Next generation scholarship must take into account his sportsman's prowess as well as the agency Grimshaw notes. Only then can we celebrate the man for his considerable accomplishments rather than focus on denouncing Flaherty for whatever faults there may be. Our present day American popular culture makes idols of our sports stars - men and women who run up and down a field or rink, accomplishing touchdowns or baskets or goals with pucks and balls. While they display a certain prowess - and I admit to watching them with elation at times - the athleticism in terms of survivalist sportsman deserves considerable praise as well. In other words, I am arging for a refocus of our attention; rather than focusing on the flaws of Flaherty's filmmaking, let's examine the human being at the center of the film. Then I think most of us can agree with Grimshaw. Nanook is an agent. A doer. A sportsman in the most profound of ways - after all, his scoring sustains his family and his community one fish at a time.